Chagdud Tulku Rinpoche belongs to the last generation of teachers to have been fully trained in Tibet in the vast wealth of Vajrayana teachings and methods. He held superb teaching lineages, primarily in the Nyingma tradition of Tibetan Vajrayana, which he taught unceasingly throughout his life. The main emphasis in whatever he taught was pure motivation. After the Communist conquest of Tibet in 1959, Rinpoche went into exile in India and Nepal. During the next twenty years, in various refugee camps and settlements, Rinpoche served as lama who administered to the refugees’ spiritual needs, as a camp leader who organized work projects, and as a physician Tibetan medicine. Lineage: In 1945, shortly after completing his first three year retreat, he went to see Dzongsar Khyentse Chokyi Lodro of Nyingmapa school. From Chökyi Lodrö Rinpoche he received the Rinchen Terzod empowerments, and caught his first glimpse of Dilgo Khyentse Rinpoche, who was attending the empowerments. 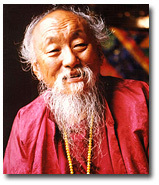 By 1946 he entered his second three year retreat, this time under the guidance of the Tromge Trungpa Rinpoche. Near the conclusion of this retreat, the death of Tromge Trungpa forced him to leave before its completion. He then returned to Chagdud Gompa in Nyagrong, and after staying there for a while, proceeded on a pilgrimage to Lhasa with an entourage of monks. He then did an extended retreat at Samye, the monastery built by Guru Padmasambhava, and afterwards attended empowerments given by Dudjom Rinpoche, who would become a main teacher as well as a source of spiritual inspiration for him. Biography:: H.E Chagdud Rinpoche was a master of ritual, especially that associated with Red Tara and Vajrakilaya, as well as a Dzogchen meditator. He remains renowned for the quality of his voice, which has been preserved on CD recordings of Rinpoche chanting T’hröma Chöd and the Rigdzin Düpa. One of the first Nyingmapa lamas to settle in the United States, he later relocated to Brazil and built the first traditional Tibetan temple in South America. The emphasis in his teachings on pure motivation for spiritual practice and all activities has inspired thousands of practitioners. There are several Chagdud Gonpa Monasteries around the world. There are two main seats of Chagdud Rinpoche in both Brazil and the USA. There are number of books under Chagdud Rinpoches name, that can be easily searched and obatain thorugh the Web. Following are few recommended ones.